My name is Greg Burnham and I took this picture of the drumset Buddy Rich played his last gig on at the Hollywood Paladium. 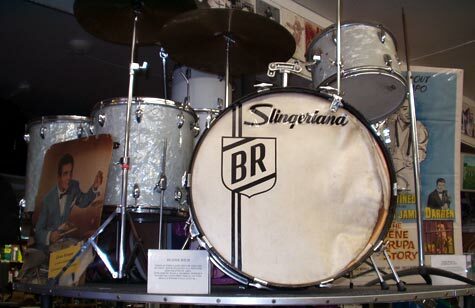 It is a Slingerland white marine pearl with a Ludwig snare drum. The posters near the drumset are of Gene Krupa and included in this photo is a picture of a cymbal once owned and used by Gene Krupa. I was given permission by a sales person at Professional Drum Shop on Vine & Gregory in Hollywood, CA. to take the photograph. Enjoy!!!!!!! !